I have just returned from a six-day road trip to Virginia, West Virginia and North Carolina, where I was photographing mostly waterfalls under fall colour. 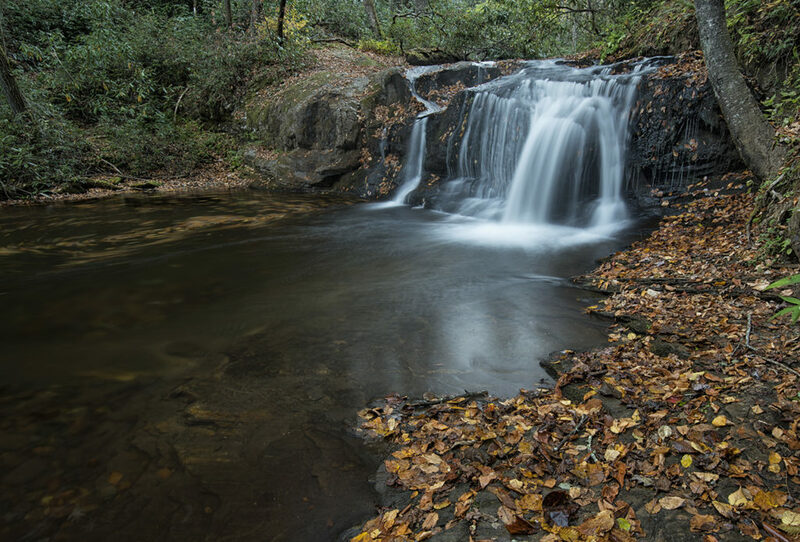 These pretty little falls, located on Avery Creek in Carolina’s Pisgah National Forest, were the last falls that I shot, on Friday afternoon, the final day of my trip. Getting to the falls required driving two-and-a-half miles off-road, then hiking three-quarters of a mile along woodland trails, before heading upstream, then scrambling down a steep bank to the base of the falls. I first scouted the falls in the early afternoon but the bright autumn sunlight and cloudless blue sky made photographing them impossible. So, I headed into Brevard, the nearest town, for lunch, then returned at around 5:00pm, by which time the sun was starting to sink in the sky and the light to soften. While first surveying the falls and envisioning how I would photograph them, the first thing that struck me was that the water all came down one side of the rocks, causing the water on the opposite side to move in a circular motion, carrying with it the brightly-coloured autumn leaves that had fallen from the overhanging trees. This presented me with an opportunity to capture the classic “swirl” of autumn leaves beneath a waterfall: a favourite subject of photographers (second image). This was my first-ever attempt at capturing a swirl image and it made for a thrilling finale to my trip. 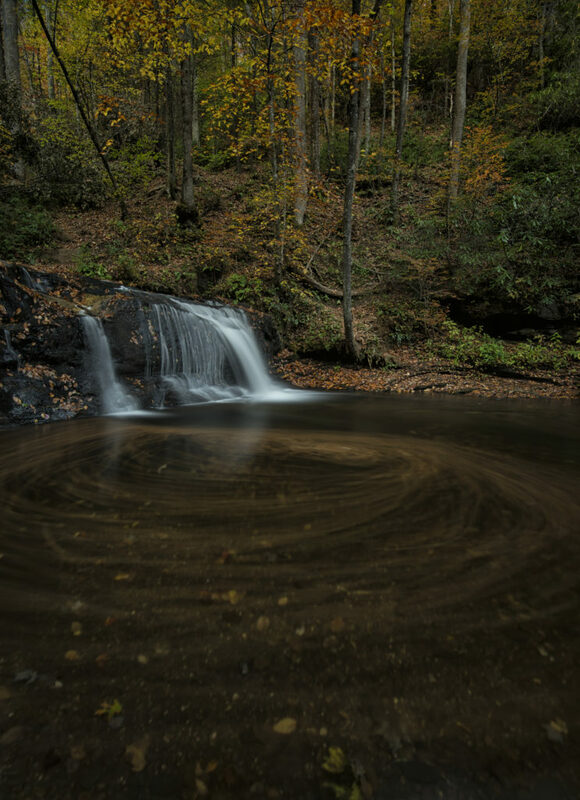 The swirl image was captured using a circular polarizing filter, to cut the glare from the water, and a six-stop neutral density filter to facilitate a long exposure of 1 minute 45 seconds. While I was happy to capture this image in the rapidly fading evening light, the downside was hiking back out of the forest in the dark.